Tisby, who grew up north of Chicago, lives and goes to graduate school in Jackson, Mississippi. 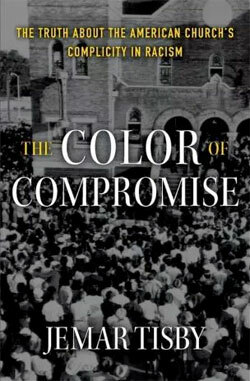 In his new book, “The Color of Compromise,” a historian-activist confronts the history of racism in Christianity and outlines steps to combat it on systemic and institutional levels. Reading book after book in his Ph.D. program on race and religion in American history at the University of Mississippi, Jemar Tisby noticed that too often, the stories of Christian Americans found them on the wrong side of issues of race and justice. He became burdened. This burden began to inform his public ministry -- speaking at events, conferences and churches -- and he felt called to compile all the things he had been learning and reading about into one book. Tisby is president of The Witness, a black Christian collective, and co-host of Pass the Mic, the collective’s podcast. He published his first book, “The Color of Compromise: The Truth about the American Church’s Complicity in Racism” in early 2019. Tisby spoke to Faith & Leadership about his book and his work toward racial reconciliation. The following is an edited transcript. Q: Why did you want to write this book in the first place? It was the intersection of three related threads. First of all, I’ve been in and around predominantly white Christian spaces for a long time. I’ve had firsthand experience of the burdens that go along with being a racial minority in Christian spaces that really don’t have a good understanding of those dynamics. Second was theology. I got my M.Div. at Reformed Theological Seminary in Jackson, Mississippi. In studying the Bible, it seems really apparent how the Bible promotes equality among all people no matter what their racial or ethnic background is. Then third was my study of history and how that coincides with current events. When Ferguson happened in 2014 and the Black Lives Matter movement began to gain national attention, it really, for me, revealed a stark difference in racial views among black and white Christians. That insight was further informed by the academic study of history, which talked about things like redlining and racial covenants and the origins of the police force. Studying those issues gave me a context for discerning why we are where we are today. Q: The rapper Lecrae wrote the book’s foreword. Why did you choose him to do that? Lecrae’s journey has been paradigmatic in many ways of the issues between black and white Christians. When he first began, he did so consciously within Christian spaces. His early following was a lot of white evangelicals. As he became more publicly vocal about issues of injustice, and as he sought to more directly impact people who came from a similar background as he did -- which often meant more black people -- then he started to get a lot of pushback. The people who had supported him before stopped supporting him, because he was saying really what should be considered some pretty obvious racial truths. He’s been through the fire, and I love his journey. Even tracing it through the discography, the topics he’s addressing, the ways he’s addressing it, the way he switched up the sound in his music. He’s doing in the rap game what I’d hoped to be doing in historical circles and theological circles. Q: How can readers navigate political polarity in the context of your argument in the book? That is to say, how can you engage people who associate anti-racism and activism with liberalism? For this, the structure of the book is really important. The first chapter lays out the big ideas and the main themes of the whole book, so if you give that a careful reading, it will help unlock the rest of the book. Then the next nine chapters are dedicated to the historical survey. I chose to organize it that way in order to give people a sense that no matter what period you’re talking about, and even what region you’re talking about, there has always been some strong evidence of Christian complicity with racism. The final chapter, called “The Fierce Urgency of Now,” is a call to action -- several practical steps that we can take on systemic and institutional levels to combat racism. The idea is that after this cascade of historical information, you will feel the weight of Christian complicity with racism and have the urge and the urgency to do something about it right now so that we don’t repeat the mistakes of the past. Q: How did you develop the title? A lot of times, when people, and Christians in particular, think of racism, they think of the more overt acts of racism, like using the racial slur or burning a cross in someone’s front yard. Obviously, those are acts of racism, but when you look at the role of Christians in American racism, oftentimes it’s been the role of cosigning the racism that others are enacting, and that can look like silence. That can look like passive support through voting or passivity. The way King talks about it in his “Letter from Birmingham Jail” is to say “the white moderate.” And so in many ways, Christians have been “the moderates” when it came to the extreme manifestations of racial terrorism. I wanted to convey the idea that you don’t have to be a foaming-at-the-mouth racist in order to perpetuate an unjust status quo. What we need to do is move beyond the passivity to active dismantling of racist structures. Q: The book argues that indifference is part of the problem. How can people who have spent their lives being indifferent begin to take action? Black people don’t have the luxury of apathy. Racism affects us every day, in both mundane and egregious ways. Taken to its logical conclusion, as history shows, racism and white supremacy actually kills people. We fought a civil war over this. People are lynched over this and raped over this, so it’s very dangerous, and we have to treat racism as a very dangerous idea that leads to very dangerous actions. What I want is for all Christians, but especially our white brothers and sisters, to feel some of that same burden. That’s what it means to be an ally. The same struggles and burdens that others bear, you begin to voluntarily take those on as well. Q: As a historian exploring racism and the Civil War era, how do you deal with the dynamic of people believing that their history is different from what it really is -- for example, thinking the Civil War was just about states’ rights? There are at least two layers to this. One is the history we’ve been told and taught, and two is the history that we want to believe. In many cases, the history we’ve been told and taught is a sanitized history. In ages past, it’s been deliberately propagandized. In the post-Civil War era, on up through the early part of the 20th century, there were just lies and falsehoods being promulgated as truth in order to promote this agenda for a majority. That has a contemporary legacy in a) the amount of historical coverage events like the Civil War get and b) the way that the social, political and economic dynamics are characterized. There’s a lot of misinformation out there, and part of the task is to dismantle or to reinform people with more accurate information, which academic historians have been doing for a long time. The church, however, hasn’t generally accessed academic historians, and so we’re impoverished in terms of our historical understanding. That’s just a question of information, though. The bigger question is, What do we want to believe? The people who cling most tightly to the myth of the Lost Cause and this idyllic version of the pre-Civil War landscape are people who don’t want to believe the heinous truth behind our history. A lot of people aren’t ready for this truth, and they don’t want to be ready. Q: Lin-Manuel Miranda has said that the “act of choosing … the stories we tell versus the stories we leave out … will reverberate” across the rest of our lives. How did you perform that act of choosing? The hardest act of choosing was focusing so much on white Christians, because when you’re talking about racism, obviously, it’s going to be white Christians who are performing the racism most often, and so the subject necessitated that. As for choosing which stories and figures, I wanted to do two things. One, I wanted to cast familiar characters and events in a new light. So I talk about Jonathan Edwards and George Whitefield. I have Billy Graham. Well-known people whose history of racism or apathy had not been highlighted. I wanted to help us rethink that which we thought we knew well. The second was just the opposite. It was to bring little-known incidents and events to light, such as the 1667 resolution by the Virginia General Assembly that baptism would not free people who were enslaved or Native American or of mixed-race descent. This is a very early example of race, religion and politics mixing and blending in ways that we can see echoes of even to this day. Q: What do you hope religious leaders, even those who find your book at odds with the history that they’ve known, will take away from the book? I hope they become activists. I don’t presume that most people are actively racist. I presume that most people are passively racist, and that means that due to ignorance, apathy and inaction, people are supporting systems, policies and practices that perpetuate racial inequality. By your very lack of action, the injustice continues. What I want to see are more Christians becoming actively anti-racist. That means directly confronting individuals and institutions that put people of color at a disadvantage. It will come at great cost to your reputation, to your paycheck, to your job prospects, to your popularity, but that has always been the case, throughout U.S. history -- that whenever people stand up against racism, they pay a costly price. Yet it’s that price that brings progress. Q: What other resources would you recommend for readers looking to engage in anti-racism? If you bought the book and did nothing but read the footnotes, it would be well worth your time. My work rests on the foundation of the primary research of dozens of other historians whom I cite in the book in the footnotes. The other resources are folks in your own community. We are blessed to live in an era where we can still talk to people who were active during the civil rights movement. Many of them are in the sunset of their lives, so time is of the essence, but talking to activists and learning from them is incredibly important. Another resource is Scripture, and very few people have attempted to read the Bible specifically looking at what the Bible teaches about how we treat one another across racial and ethnic lines. Looking at it through that lens can give a little insight even into familiar passages. For instance, Genesis 1:26-28 taught me about humankind being made in the image, or likeness, of God. This has vast implications for the way we treat people who look different than we do. I also really encourage folks to take pilgrimages to historic sites. You simply can’t replicate the gravity of history through a book or on a screen, but when you go to those places, you feel in a visceral, even soulful way the importance of what happened there. You can really focus on your heart in the ongoing struggle for freedom.